Were you injured or did a loved one die in a motorcycle accident in New York? 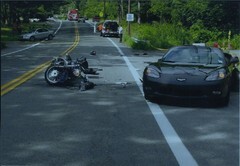 Our NY motorcycle accident attorneys can help you. Motorcycle cases present unique challenges because of the public bias against operators of a motorcycle in New York. The public perception often is that anyone driving a motorcycle is Evel Knievel or some other daredevil. People have seen and heard motorcycles weaving in and out of traffic with the driver certainly being a member of a motorcycle gang. Therefore, anyone injured driving a motorcycle must have gotten what he/she deserved. The attorney’s role is critical in identifying and overcoming these biases. It must be shown that the motorcycle operator was operating his motorcycle in a reasonable, prudent and legal manner. The attorney must communicate that the client was not driving an alien vehicle - it is a motorcycle and the law in New York allows people to drive them as long as they operate them subject to the same rules of the road just like any other vehicle, with specific exceptions under the New York Vehicle and Traffic Law. Motorcycles are not as stable as other vehicles because they have only 2 wheels. Motorcycles are smaller and lighter than other motor vehicle (i.e. cars, trucks and buses) and are more susceptible to a lighter impact causing greater damage. Additionally, motorcycles are particularly susceptible to dangers from roadway defects or poorly maintained roadways in the City and State of New York caused by poor roadway maintenance or construction. Potholes, drainage and other roadway defects can be far more dangerous to a motorcyclist than the driver of an automobile. Motorcyclists must observe the same rules of the road and be accorded the same rights as the operators of all other vehicles except as to any special regulations of the New York State Vehicle and Traffic Law including, the required use of helmets and visible front and rear lamps - New York State Vehicle and Traffic Law §381. The insurance and liability rules in New York are very different for motorcycles than for cars. A motorcycle is not a motor vehicle within the meaning of the No-Fault Law. Since motorcycles are exempt from the definition of motor vehicle, a motorcyclist is not a covered person under the No-Fault Law and is not entitled to these medical and lost wage benefits. However, motorcyclists injured in motor vehicle accidents are not subject to the “serious injury” threshold under New York No-Fault Law. Thus, a person injured on a motorcycle can bring a claim against the offending driver even for minor injuries that would normally not pass the No-Fault threshold. New York Motorcycle Insurance minimums are $25,000 per person injured in any one accident and $50,000 because of the death of one person in one accident and $50,000 for two or more persons injured in any one accident and $100,000 for the deaths of two or more persons in one accident. UM/SUM Coverage is also available to owners of motorcycles. An injured motorcyclist’s insurance policy will reveal the amount of UM/SUM coverage they have purchased and is available to them. The attorneys at Gair, Gair, Conason, Rubinowitz, Bloom, Hershenhorn, Steigman & Mackauf advocate for our clients' full financial recovery through detailed, meticulous preparation for trial. If you have suffered a serious personal injury or a loved one died as a result of a motorcycle accident, please Contact our firm to discuss your case.